Then she was gone – just like that! Micah was worried and alarmed at her words. 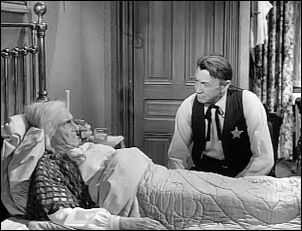 The minute I came into town he called me into his office and told me what Mrs. Caruthers had stated on her deathbed. “She said I’d day seven days after she did.” I couldn’t really believe such a crazy statement, and I wasn’t really taking it seriously. Micah repeated her words to me again as Mark and I listened…again! She was going to kill me because I killed her husband. This was really too much to take in. It didn’t make any sense. None the less, though, Mark was upset. “Why, she must have plum out of her head! She’s gone. How can she do anything?” Mark asked. Micah didn’t know what to believe. "Sarah Caruthers was a determined woman. She had no respect for the law. When a woman like that makes a dying threat, I wouldn't treat it to lightly Lucas." Just then Ben Casper, our town attorney, came in. He wanted to talk to me. "Well I'd like you as head of the council, to call a special meeting at the town hall tonight." "Special meeting, why?" I asked. "Can I go too Pa?" Mark asked. I walked over to him and put my hand around his neck as I looked into his face. "Look son, what concerns me concerns you,” I told him in a calm voice. I didn’t like seeing that worry in his eyes, but there wasn’t anything I could do about that. Eli Benson interrupted him. “What’s my kids got to do with this?” He was concerned. Ben told him he’d find out. He held up the will. “Now this is the last will and testament of Sarah Caruthers. I drew it up for her and I can assure you it is absolutely legal." He said the Will would speak for itself. The crowd was restless, trying to figure out what was going on. Eli ordered him to stop gabbing and read it. He did as requested. "I Sarah Caruthers being of sound mind and memory do hereby give, devise and bequeath all the worldly goods and monies of which I die possessed, to the residents of the town of North Fork, territory of New Mexico, to be divided equally among every man, woman and child, resident therein at the time of my demise." At that, everyone began chatting. Eli stated she had no money. Eli wanted to know if this was a joke. Ben assured him it was no joke. Even Milly was confused. “But she didn’t have any money. She owed me $17 for things she got at the store.” Eli said that she couldn’t even pay her bill at the hotel. I sat quietly, listening to the whole thing. Ben said it was time for John Hamilton to talk. John stood up to make his announcement. He announced that the Caruthers both kept a strongbox in his bank. It was no concern of his as long as they paid the rental for the space. When Sam was killed, Mrs. Caruthers told John that the box wasn't to be opened until after her death. He opened this morning. Micah asked what was in it. That really got the crowd excited. They all began talking loudly and excitedly. I just stared at the crowd and sat quietly. I knew there was more to this story, and I was very uncomfortable with what was going on. Micah suddenly stood up and demanded silence. “John, where would a woman like Sara Caruthers get that kind of money?” he asked. Eli was being argumentative though. “You’ve got no proof that money was from the Denver Mint shipment or any other robbery!” But Micah had a list of serial numbers going back quite a few years. "That strong box is impounded as of now.” The crowd began talking again, not happy with that news either. But Ben wasn’t done yet. There were more surprises yet to come. He said there was one more provision to the will. "On the provision that Lucas McCain,” Ben suddenly looked at me. I could tell this wasn’t going to be good news for me. “That Lucas McCain shall not survive said demise by a period of more then seven days." At the reading of those words, I turned to look at Mark. It broke my heart to see the worry on his face. Milly suddenly stood up, shocked by his words. "Are you saying that Lucas has to…has to die?" She asked in a worried voice. "So that these people can get that money if they have a legal claim to it." "Those are the terms of the will," Ben answered. "I’ve never heard of such a thing. It's preposterous, Milly exclaimed. Milly didn’t want to think about it anymore. "Well I move this meeting be adjourned and all this nonsense be forgotten here and now," she stated. Everyone stood up, agreeing with Eli. "Well I guess the meetings over Ben, you can throw that thing in the waste basket," said Micah. “I’d be pleased,” Ben stated. “However, I do have to file it.” He laughed nervously. "Who knows, Luke might get struck by lightening before the weeks out. Of course, nobody found his joke funny. The room grew even more silent then before. Ben lost his smile, realizing his joke was in bad taste. "Well now if that happens, at least I'll know it’s not Sarah Caruthers doin' it," I stated. The meeting broke up. Micah and I made our way over to Milly and Mark. "It must be nice knowing you have so many friends Lucas," said Milly. I sat down and smiled at her. It was nice to have so many people upset and worried about me. I watched and listened curiously as Milly suddenly gave Mark the key to the back door of the store and sent him over to get some licorice sticks. I knew she wanted to get him out of the way so she could talk to us without his hearing. Milly could tell Mark was already upset enough, and I could tell Milly was worried about me. I asked her what she wanted to talk about. “You two,” she answered. “You’ve lived in this town about as long as anyone. You’ve seen them come and go, all kinds…” She suddenly stopped and stared at me. “Well, go on,” I urged her. She just stared at me, waiting for my reply. What could I say? "Like you said Milly, they are my friends." The next morning, John met Micah, Ben, Milly, and me at the bank. I stood back and watched as Micah got out the serial numbers. There sure was a lot of to check! As Micah and John worked together on it, I just shook my head. “What’s the matter?” Mark asked. That’s why I was trying to hurry away. I didn’t want Mark to see how worried Milly and Micah were. “Nothing, Mark,” I tried to assure him in a confident voice. Micah went so far as to stated he ought to lock me up where I’d be safe, but I figured I’d be safe enough at the ranch. “Now look, I know these people. If I can’t trust them, I can’t trust anybody!” I exclaimed. “What about Mark?” Milly asked. After we left, Eli asked Micah what was going on. Micah was very concerned. He couldn’t put a hold on the money because the serial numbers didn’t match. "It belongs to the people of North Fork. If any of you want to claim it under the terms of the will. Of course if you do, you'll never get a chance to spend it. Unless you want to hang first-“ Micah watched as Mark and I rode past on our horses. “-for killing Lucas McCain." I didn’t have much luck calming Mark done, and he did not want to leave me alone; nor did he want me to get into town. He took his time in getting off to school the next morning. I told him he better hurry, but he just rode up to where I was saddling my horse and sat there. I suddenly turned, realizing something was wrong. “I have to. I gotta let Milly know how much feed I want to order for next month,” I answered sternly. My eyes never left his, and my face told him everything he needed to know. “Well…you know…the time would be up then,” Mark answered. “Yeah, but suppose that-“ Mark stopped. He couldn’t…or wouldn’t…finish that thought. Mark smiled. He knew I’d be okay. I had managed to restore his confidence. “I’ll see you after school, Pa.” I smiled as I watched him ride off. All was well with Mark McCain again! But I knew his fears wouldn’t be completely gone until the week was up and he saw that I was still alive. I picked up my rifle to get it ready when I suddenly heard a horse neigh behind me. I turned my hid around to see a stranger slowly approaching me. He smiled friendly enough and asked me if this was my spread. I told him it was. “Oh, Beldon. Stacey Beldon.” His smile never left his face. “Luke McCain.” A smile never appeared on my face. I was suspicious of this man. He suddenly told me it was a hot day. As I continued staring at him, I told him it was about three miles to North Fork. “I’m…uh…heading that way myself.” He said if I gave him a chance to water his horse he would keep me company. I untied Razor and walked over to the well. He commented on how pretty it was around here. “Yeah. What brings you to it?” I asked. He told me he had a job opportunity, and he only reckoned it was in North Fork. He said the last time he saw Eli he was celebrating his first born. I told him he celebrated it ten more times. He smiled. “Well see that…I don’t recall saying that.” He flashed me a big smile. I told him we better get going to town. “I just wanted to be sure,” Benson stated as he got up his horse. I rode on to Micah’s office. Micah immediately wanted to know who he was. He commented that I was keeping strange company. “He says he’s got some work to do here,” I commented. Micah said Eli was at Milly’s store. I started to go, but Micah asked me why I was in town. “Any reason why I shouldn’t be here?” I challenged him. "You related to Stacey Beldon?" Micah asked. That question upset Eli. "Who said?" "Beldon did Eli. He's over at the saloon," I announced. "Why that no good murdering.....what's he doin' here marshal?" Eli asked. "Apparently he's got some work to do," Micah answered as we continued staring at Eli. "No, it wasn't me, it wasn't me. You gotta believe me,” Eli stated. But we still weren’t convinced. Suddenly, Stacey was standing outside the bar. "Eli! Is that you cousin Eli?" "Yes Stacey it's me. How are you, Stacey? It's been a long time." "Yeah, it has been a long time, and I'm fine, just fine, Eli. Eleven kids. Why don't you come over here and have a drink with me? I already invited Mr. McCain. How about it McCain?" Eli told him no thank you. “Eli, the will was read four days ago. You could have sent for him,” I stated. But he still swore he had nothing to do with Stacey’s showing up. “Alright, Eli.” I told Micah we should go see Ben. “Yeah, Ben…the lawyer,” Eli suddenly stated. I got to thinking on that. Yeah, now I really wanted to talk to Ben. “I told you I’d be over later!” I shouted impatiently. “No wait. Right now. Come on, have a drink!” Stacey said again, with that same evil smile on his face. I turned and started toward him, my rifle in hand. “Well that’s too bad, Beldon. Now, let me tell you something. I drink with whom I pleas, where I please, when I please. No two-bit gunfighter’s gonna come in here telling me what to do. You understand that?” We just stared at each other. “Now, let’s quit beatin’ around the bush. You got business with me, let’s get on with it,” I challenged him. “Did I say I had business with you?” That evil smile of his was suddenly back. “If I have to call you to make you admit that somebody hired you to gun me down, then I’m calling you!” I stated sternly as I gave him a cold, hard stare. “See that, Marshal. He’s calling me.” Stacy played his last play. He dropped his glove, then bent to pick it up, but he reached for his gun as he did so. I was watching and ready for him. He didn’t have a chance. I killed him. Ben hurried out of his office wanting to know who he was. “Don’t you know?” Micah asked. “No, how should I know?” Ben asked. "Good Lord, he tried to kill you Lucas." We all walked over to Stacey’s body. Milly ran out and hurried up to me. I put a protective arm around her as we started down the street. Eli bent down over his cousin and took a note from his pocket. He read it then stood and handed it to Micah. In spite of the man Stacey was, Eli still mourned for his cousin’s death. “Reckon I’ll claim the body, being as how I’m the only living relative here abouts.” It was easy to hear the sadness in his voice. Micah read the letter silently. “Micah, what is it?” Milly finally asked. Micah turned to Ben. “You know that envelope? The one that wasn’t supposed to be opened until after Lucas-“ Ben said yes. Mrs. Caruthers had written to Stacy telling him to pick up an envelope containing $5,000.00, only if he killed me. The envelope Ben was holding contained the money to pay Stacey and the mailing instructions. "She said she'd be laughing from her grave. She almost did," You know, that was kind of a eerie thought! Mark wanted to know where it was going. Micah was sending it to the Marshal in Santa Fe. Micah was finally able to determine that money was stolen after checking with Washington. "Good riddens I say,” stated John. John stated he hadn’t slept right since the reading of that darn will. Milly didn’t think any of us had. We were all glad it was over. Suddenly, my charming little boy spoke up "That Mrs. Caruthers and all she tried to do, I think there's one thing she didn't figure out." We all looked at Mark as he spoke his words of wisdom. "Well, when you got a lot of fiends, I mean like what Pa has in North Fork. Well.....there just isn't that much money in the world." Wow! That boy can sure surprise you sometimes! But I thought he was being way to serious so I gave him a swift pat on the backside. That got him to moving alright! I told Milly I’d buy her some coffee. We started down the street arm-in-arm, happy once again to be laughing and joking. piddlin' stuff.....Ed Nelson appeared in three episodes ― Dead Cold Cash as Stacey Beldon, the gunslinger hired by Sarah Caruthers to kill Lucas ― The Illustrator as Ben Travis, the cowboy who murdered Sam, the tailor ― First Wages as Ben Vargas, he was the cowboy who took Mark's horse. Steve Darrell played Eli Benson in Dead Cold Cash, he was the cousin of Stacey Beldon, the gunslinger Sarah Caruthers hired to kill Lucas ― Obituary as Ben Russell, the man who was killed by Panama Billings (Chris Alcaide). 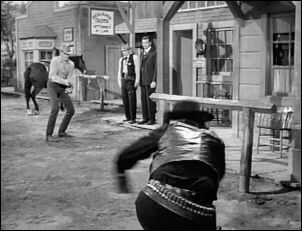 Chris Alcaide appeared in ten episodes ― The Trade as Hamp Ferris, he was the cowboy who wanted to turn Morley in for the reward ― Obituary as Panama Billings, he was the gunfighter who rode into North Fork trying to make a name for himself and another notch on his gun ― A Case of Identity as Lon Perry, he was the cowboy along with his partner Captain James Gordon who scheme to make Wingate think Mark was his son ― A Time for Singing as Spence, the leader of a gang of bank robbers who were going to rob the North Fork Bank ― Meeting at Midnight as Schroeder, he was working with Benton & Morgan to break Carl Miller out of jail ― Dead Cold Cash as Ben Casper, the attorney for Sara Caruthers ― The Wyoming Story part 1 & 2 as Ross, the Henchman for Forbes McKee the Indian Agent ― The Journey Back as Will Carney, he was looking for revenge for his brother's death ― Squeeze Play as Dave Rankin, the heavy for Willard Prescott. Gee how many times did John Anderson star in The Rifleman? Who appeared in the most episodes Chris Alcaide or John Anderson? How about John Milford? Sara Taft appeared in three episodes ― Dead Cold Cash as Sara Caruthers, she was the bitter old woman who wanted Lucas killed within one week of her death ― Waste 1 & 2 as the old woman. 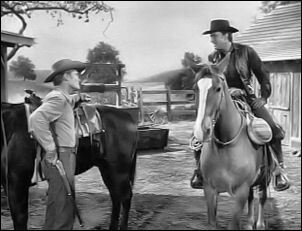 Gordon Armitage appeared in six episodes of The Rifleman as a townsman ― The Hangman ― Baranca ― Dead Cold Cash ― The Illustrator ― The Lonesome Bride ― The Tinhorn as Joe, a card player. Dave Kashner as a Townsman in Dead Cold Cash. Joan Taylor played Milly Scott. Milly bought The General Store from Hattie Denton. Hattie had to leave to go and help her sister in Denver. 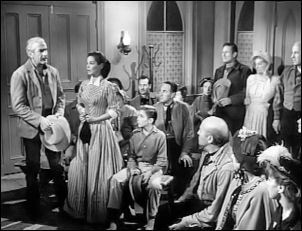 Joan Taylor appeared in eighteen episodes as Milly Scott and was introduced to The Rifleman in Miss Milly. 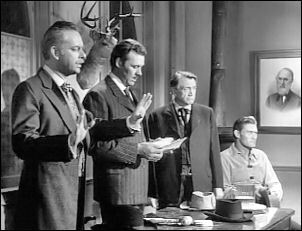 Dave Kashner appeared twice in The Rifleman ― The Hero and Dead Cold Cash as a Townsman. 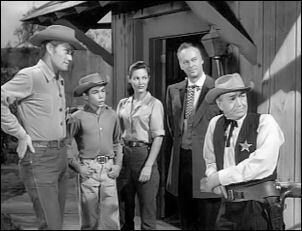 Besides The Rifleman, Dave only appeared in one other TV Series, The Adventures of Jim Bowie (1957). Have you ever been watching TV or a movies and wonder who is that guy?